The lighted garlands around the perimeter of the fountain island in The Circle will be taken down today (Wednesday, Jan. 3) ahead of the expected rains. They were to stay up until Saturday, but the wet weather expected today means it is better to take them down now, so they can be dry when stored away until next year. The rest of the decorations (on the bear cubs) will come down Saturday as planned. Again, happy new year and thanks for your support. Just a quick note. 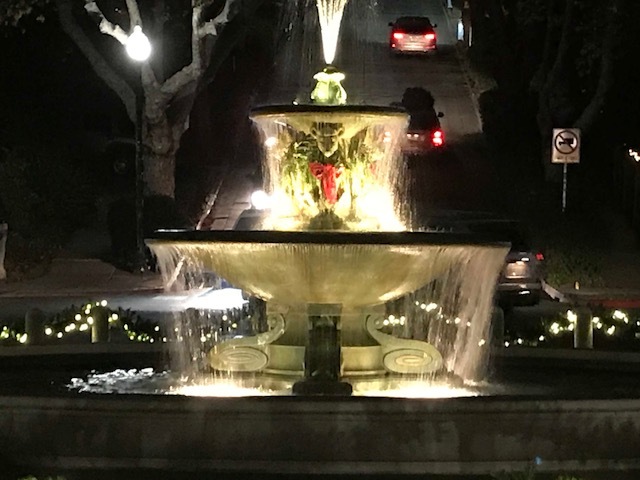 The fountain will be off tonight, New Year’s Eve, to avoid another late-night soaping by holiday “revelers.” It will be back on in another day. The lights and garlands are scheduled be up through Friday, and come down Saturday during FOFW’s monthly work day (first Saturday of each month, starting at 9 a.m.). The lighting of the fountain is a gift to the community that we enjoy putting up as much as we hope you enjoy seeing. Thanks to everyone who has shown support for FOFW through financial support (you can still make a secure, online tax-deductible gift for 2017 for a few more hours right here) or volunteer work. We are fortunate to have such great friends and neighbors.